The Adhaalath Party will not join discussions held between the opposition Maldivian Democratic Party (MDP) and the Jumhooree Party (JP). In a brief statement released by Adhaalath yesterday (January 31), it was announced that the party’s council had decided it would not “for the time being” participate in talks held by the two opposition parties, giving assurances that it would “closely monitor” events. “If the occasion calls for discussions in relation to national interests that concern the citizens, Adhaalath Party will maintain and follow the noble principle of negotiation and discussions with the government and other parties”, the statement read. After the MDP and JP officially agreed to work together in defence of the Constitution last week, JP Spokesman Ali Solih said he believed Adhaalath would enter the talks. However, Adhaalath Spokesman Sheikh Ali Zahir told Minivan News today that the decision had been taken because “no such talks were found to be of use for the time being”. He denied any pressure from the government regarding the party’s participation in the talks, stating that “Adhaalath is an independent political party” and that “the party is in no formal agreement with the government”. The party, which has just one MP in the 85-seat Majlis has been considered an unofficial partner in the ruling Progressive Coalition, which now directly controls 49 seats in the house after further party switching last week. Meanwhile, MDP Chairperson Ali Waheed tweeted in response to Adhaalath’s decision stating that he respects the decision taken by the party, expressing his gratitude over the decision to closely monitor the state of the country. Although Dhivehi Rayyithunge Party leader Mohamed ‘Colonel’ Nasheed was not responding to calls at the time of publication, he told Minivan News last week that the party had received the invitation for all-party talks and that its council had not yet decided on the matter. Vice President of ruling Progressive Party of Maldives (PPM) Abdulla Abdul Raheem was not responding to calls at the time of press. 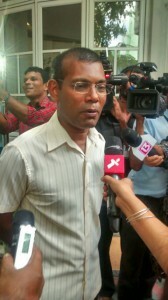 The party has yet to officially comment after MDP leader Mohamed Nasheed had called for its involvement in the talks. After “successful” talks between MDP and JP on the eve of January 27, the JP hosted a rally at their headquarters in Maafannu Kunooz yesterday, in which senior MDP members and supporters participated. As he had during an MDP demonstration in support of JP leader Gasim last month, MDP Chairperson Waheed appeared alongside JP leader MP Gasim Ibrahim, while the parliamentary groups of both parties also attended. The JP – which has 13 MPs in the Majlis – last week voted through its national council to give Gasim the authority to make all decisions regarding actions needed to defend the Constitution. Nasheed has recently reiterated calls made in early December to install Gasim as president, telling Raajje TV last week that his main aim was to have the Maamigili MP oversee an early election from the President’s Office. A PPM has proposed to amend the Constitution, however, which would reduce the eligibility for presidential candidates to those aged between 35 and 65. The JP was officially aligned with the ruling PPM until Gasim’s decision to stand for the Majlis speaker position, after having given crucial backing to Abdulla Yameen in the 2013 presidential race. The opposition Maldivian Democratic Party (MDP) and the Jumhooree Party (JP) have officially agreed to work together in defending the Constitution. JP Vice President Ibrahim Ameen – who represented the party in talks held last night – described the meeting as “successful”, saying the parties agreed to cooperate in defence of the Constitution, both inside and outside of the Majlis. An outline of the course of action was also reported to have been agreed upon, though Ameen refrained from revealing specific details. The meeting represented the first official talks between opposition parties after MDP leader Mohamed Nasheed called for all-party talks last week, citing persistent breaches of the Constitution by President Abdulla Yameen’s government. Earlier this week the JP officially severed its ties with the ruling Progressive Coalition – defunct since May last year, with party leader Gasim Ibrahim inviting all opposition parties for talks. While MDP Chairperson Ali Waheed, Malé City Mayor Mohamed Shihab and former Majlis Speaker MP Abdulla Shahid participated in the talks on behalf of MDP last night, the JP was represented by Ameen, Dr Hussain Rasheed, MP Ali Hussein, and former Police Commissioner MP Abdulla Riyaz. Minivan News was unable to obtain a comment from MDP Chairperson Waheed at the time of publication. The JP has also invited the Dhivehi Rayyithunge Party (DRP) and the Adhaalath Party to the talks, despite the religious party being an unofficial member of the governing coalition. DRP leader Mohamed ‘Colonel’ Nasheed confirmed to Minivan News that the party had received the invitation for all-party talks and said that the party council has not yet decided on the matter. “We are working to schedule a council meeting today”, said Nasheed. Adhaalath, which holds a single seat in the People’s Majlis, has received an invitation to future talks but has not yet decided on whether it will attend, the party revealed through its official twitter account yesterday. JP Spokesman Ali Solih claimed today that Adhaalath has accepted the invitation, though they have not officially replied to it. “As per Adhaalath’s regulations and internal mechanism, the party also will need to consult with relevant bodies. We are very optimistic that Adhaalath also will cooperate in the efforts to defend the constitution”, Ali Solih said. Minivan News was unable to obtain a comment from Adhaalath as the party’s President Sheikh Imran Abdulla and Spokesman Sheikh Ali Zahir were not responding to calls. The JP – which has 13 MPs in the 85-seat Majlis – this week voted through its national council to give leader Gasim Ibrahim the authority to make all decisions regarding actions needed to defend the Constitution. Unofficial talks were announced earlier this month between the JP and MDP, which holds 22 seats in the Majlis, while former President and MDP leader Nasheed has pledged to defend Gasim against government attacks. The Civil Court has on Sunday ordered the Dhivehi Rayyithunge Party (DRP) to pay MVR1,111,438.96 (USD72,406.45) to Maldives Transport and Contract Company Plc (MTCC). The party was taken to court by the MTCC after its failure to pay this amount for services rendered to the party during the 2008 presidential elections, in which the party’s then-leader Maumoon Abdul Gayoom lost to the Maldivian Democratic Party’s Mohamed Nasheed. The Civil Court verdict in the case orders the party to split the payment and complete payments within a period of six months. Earlier in April, the Civil Court ordered the party to pay back a debt of over MVR700,000 (USD45,602.61) to HUB Company. The DRP was later fined by the court for ts failure to complete payment as per court orders. Island Aviation Services are also currently suing the party seeking repayment of debts. After backing unsuccessful candidates during the 2013 presidential election, the DRP failed to win any seats in the 2014 Majlis elections. Police have denied arresting six men yesterday from an independent prayer congregation at the Dharumavantha mosque in Malé, despite media reports to the contrary. “Reports in some media [outlets] about police arresting people who performed Friday prayers in an independent congregation at the Dharumavantha mosque [on October 3] were published irresponsibly in an attempt to mislead the public,” police insisted in a press release yesterday. On Wednesday (October 1), police arrested a 34-year-old man for leading an independent prayer congregation and delivering unauthorised Friday sermons at the mosque. The Imam was taken into custody with an arrest warrant on charges of “attempting to incite religious strife and discord” and leading prayers without authorisation from the Islamic ministry in violation of the Protection of Religious Unity Act of 1994 and regulations under the law. Police stressed in yesterday’s press release that no further arrests have been made. Police were not active in the area and no attempts were made to prevent the independent congregation from performing Friday prayers, the press release stated. Local media reported eyewitness as saying that the Friday prayer was led by former opposition Maldivian Democratic Party (MDP) MP Mohamed Rasheed ‘Kubey’ while a loudspeaker or megaphone was provided by Dhivehi Rayyithunge Party activist Mohamed ‘Eagle’ Shareef. Both Kubey and Shareef have reportedly been attending the mosque regularly for Friday prayers. A member of the independent congregation told online news outlet CNM that the mosque’s sound system has not been seen since the Imam was arrested. “Today the govt acted against radicals but MDP stepped in & helped them spread their message. I thought we were together in this fight,” Home Minister Umar Naseer tweeted late afternoon on Friday. “MDP will have to decide whether to be with us or with them,” he added. MDP Chairperson Ali Waheed was not responding to calls at the time of press. At a press conference last month, Naseer revealed that efforts were underway to stop the independent congregation gathering at Dharumavantha mosque. “Putting a stop to it is not just physically going there and stopping them sometimes with shields. Due to the nature of the [issue], we want to advise them and explain to them how it is in religion,” Naseer said. The Islamic ministry had summoned members of the separatist prayer group and conducted “one-to-one” counselling sessions, Naseer revealed. “Unless all these efforts fail, we will not use the force of law,” Naseer said. Police noted in a statement last week that the Dharumavantha mosque was not among mosques designated in Malé for Friday prayers. “And those delivering sermons and issuing fatwas there have not sought authorisation from the Islamic ministry,” police said. Under the religious unity regulations enacted in May 2010, permission and written approval must be sought from the Islamic ministry to preach, give sermons and issue religious edicts in the Maldives. Scholars seeking a license to preach are required to have at least a first degree in religious studies from an institution recognised by the government. In April, President Abdulla Yameen ratified amendments to the Religious Unity Act – which came into force mid-July – outlawing independent or unauthorised prayer congregations. The penalty for violations of either the law or the regulations is a jail sentence of between two to five years. In February this year, the Malé City Council posted a notice on the Dharumavantha mosque stating that it would be temporarily shut down at the request of the Ministry of Home Affairs. The prayer group had been described as “extremist” by Islamic Minister Dr Mohamed Shaheem Ali Saeed. However, the congregation gathered for prayers the next Friday and prayed for God to destroy the government as well as for victory against the “irreligious” government that was attempting to “obstruct the spreading of Allah’s message”. The Imam also prayed for God to destroy and send his wrath upon military and police officers who implement the government’s orders. Despite the notice, the group continued to gather for prayers at the mosque and conduct Friday prayers every weekend at a time earlier than the time set by the Islamic ministry. Local media reported last month that the Dharumavantha mosque’s Imam accused the government in a Friday prayer sermon of declaring “war” against the congregation. A prayer was also offered against the government’s alleged efforts against the “true invitation” and for Allah to strike fear into the hearts of police and army officers who might be used stop the unauthorised congregation. The Elections Commission (EC) has announced preliminary results of Saturday’s parliamentary elections for 71 of the 85 constituencies. Acting EC Chair Mohamed Farooq told the press yesterday that the delay in the full announcement had been due to result sheets faxed from across the country being unclear. Farooq had explained earlier that preliminary results are uploaded to the EC website after double checking the sheets to ensure there were no errors or inconsistencies. While the results of more than 40 constituencies were announced yesterday, the EC resumed announcing the rest this morning, reaching 71 as of the time of press. With almost all result sheets checked, the results published on the EC website for the remaining 14 constituencies are unlikely to change. The EC reopened five ballot boxes in the presence of candidate representatives and the media last night after discovering mismatches in the number of votes received by candidates and the total votes cast. The recount did not affect the outcome of the polls in any of the five constituencies. Preliminary results show that of the 85 seats in the People’s Majlis, the ruling Progressive Party of Maldives (PPM) won 33 seats along with 15 seats and five seats respectively for coalition partners Jumhooree Party (JP) and the Maldives Development Alliance (MDA). The Progressive Coalition secured a combined total of 53 seats, well above the 43 simple majority required to pass legislation. Independent candidates won in five constituencies while the religious conservative Adhaalath Party (AP) took one seat. The opposition Maldivian Democratic Party (MDP) secured 26 seats, which was the same number of seats it won in the first multi-party parliamentary elections in May 2009. The main opposition party suffered surprising defeats in traditional strongholds such as the capital Malé, Gaaf Dhaal Thinadhoo, Haa Alif, and Addu City. Of the 28 incumbent MPs who failed to retain their seats, 17 were from the MDP, four from the PPM, three from the JP, two independent MPs, one Dhivehi Rayyithunge Party MP and one Adhaalath Party MP. While 23 female candidates competed in the elections, only five were elected, including three MDP candidates, one PPM candidate and one Adhaalath Party candidate. Voter turnout in Male’ was well below the national average. With the exception of Galolhu South at 70 percent, turnout in other constituencies in the capital was below 65 percent. The lowest turnout was for the Maafanu North constituency at 50 percent. In the wake of the coalition’s victory at the polls, Tourism Minister Ahmed Adeeb – deputy leader of the PPM – has asserted that that there are now no “obstacles” now for the administration of President Abdulla Yameen to implement the PPM manifesto and fulfil campaign pledges. “God willing, we will use the trust placed in us by citizens responsibly and work through parliament to give legal power to the [policies] in our manifesto,” he said. The government’s 207-bill legislative agenda includes amending pension laws, designating special economic zones, and strengthening the legal framework for foreign direct investments. Adeeb said the government has received congratulations from international partners and foreign investors. Adeeb also revealed yesterday that some independent candidates have expressed interest in joining the PPM. 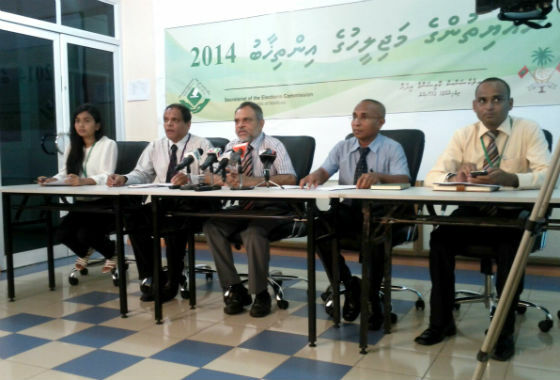 While 114 independent candidates contested the Majlis polls, only five were elected. Of the 302 candidates, 188 contested on party tickets. Following his loss to an independent candidate, JP MP for Lhaviyani Naifaru, Ahmed Mohamed, accused the PPM of attempting to “destroy” its coalition partner. The veteran MP explained to online news outlet CNM that PPM members contested as independents in constituencies assigned for the JP in the seat allocation deal reached among the coalition parties. While the independent candidate – Ahmed Shiyam – used the PPM party office, colour and logo in his campaign for the Naifaru seat, Ahmed alleged that the government gave jobs and promotions in the nearby Felivaru fish cannery at his request. “And if that wasn’t enough, [they] anti-campaigned against me while voting was ongoing,” he claimed. JP MP for the Hithadhoo South constituency, MP Hassan Latheef, also accused the PPM of campaigning against him after two senior members of the ruling party contested as independents. Speaking to the press in Hithadhoo yesterday, Latheef reportedly alleged that the PPM members used money to bribe voters and influence within the government to provide jobs. Latheef also noted that he was not invited to a campaign rally in Hithadhoo last week that was attended by President Yameen. The two independent candidates were however present at the rally, he said. JP Leader Gasim Ibrahim meanwhile told the press yesterday that the party lost 12 out of the 28 seats it contested for because of coalition party members contesting as independents as well as Adhaalath Party candidates competing in 12 constituencies. He however added that the winning independent candidates were likely to join coalition parties in the near future. Along with the five independent MPs-elect and the Adhaalath party MP-elect Anara Naeem, the Progressive Coalition would be six votes short of the super-majority needed to amend the constitution. Over 300 candidates will today contest for 85 seats in the 18th People’s Majlis as the Maldives holds its second multiparty parliamentary polls. Representatives of the governing Progressive Coalition have been divided among constituencies, with the Progressive Party of Maldives (PPM) competing for 50 seats, the Jumhooree Party for 28 seats, and the Maldives Development Alliance vying for 7 places in the recently expanded parliament. The opposition Maldivian Democratic Party (MDP) will field candidates in all 85 constituencies, while its recent ally the Dhivehi Rayyithunge Party will contest for 6 seats. The religious Adhaalath Party will stand in 12 constituencies after disagreements within the governing coalition – with whom it had allied itself during last year’s presidential vote. 114 candidates will stand independently for today’s vote. After last minute concerns about a potential delay of polls, the Elections Commission (EC) has confirmed that voting will proceed at 8am before closing at 4pm today. Repeated delays and the heavy involvement of the Supreme Court in last year’s presidential poll eventually contributed to the dismissal of the EC’s senior members earlier this month and the subsequent filing of a case on Thursday (March 20) which suggested today’s polls could not legally proceed. “So far we have not heard anything from the Supreme Court, so we are going ahead,” EC Media Officer Aishath Shifana Ahmed told Minivan News this morning. The significance of today’s polls has been underlined by the MDP’s Hamid Abdul Ghafoor, who has described the elections as “do or die”. Among the party’s prominent pledges are judicial reform, the empowerment of local councils, and potentially the impeachment of President Abdulla Yameen. The PPM has meanwhile repeatedly asserted that the public should grant the Progressive Coalition a majority in the Majlis in order to allow it to fulfil its legislative agenda, as well as reiterating previous pledges to defend Islam. “The government has made many important electoral pledges. However those pledges can be fulfilled if only the people elect members of the Progressive Coalition government,” JP leader Gasim Ibrahim told Miadhu this week. 11:30pm – As local media reports continue to show strong evidence of a resounding coalition victory, Vice President Dr Mohamed Jameel Ahmed has called upon all elected MPs to “formulate and implement all that’s necessary for the development of our people and nation”. Meanwhile, the MDP’s International Spokesman Hamid Abdul Ghafoor described the result as “not the best”, expressing long term fears over the direction in which he sees the country heading. 11:00pm – The EC expect to be able to announce their provisional results between 8am and midday tomorrow. 10:45pm – The EC have just concluded their press conference, noting that polling generally went smoothly. The only major incident was reported in Rakeedhoo, Vaavu atoll after a group of people came to vote after polls had closed. After the controversy, with the exception of official in charge of the box and the person’s assistant, officials refused to count the votes. According to the law, noted the EC, the box has to be counted at the station and so the EC will have to send some people there. The police have been asked for their assistance. One other issue was related to ballot papers in Alifushi in Raa atoll, and in Mahibadhoo in Alify Dhaalu atoll. Two people are still waiting to vote after the EC sent the wrong ballot papers to the station. By 9:30pm, the EC reported receiving 115 complaints in writing, 18 of which were about the voters registry. Other complaints – were received by phone – included anti-campaign and complaints against elections officers – some of whom have had action taken against them. Celebrations tonight will be considered as a campaign activity, noted the EC, and will have to wait until after 6am tomorrow. 10.20pm – With most races too close to call, state broadcaster TVM has confirmed 19 seats where candidates have an unassailable lead. These include ten seats for the ruling PPM, four seats and one seat respectively for its coalition partners JP and MDA, one seat for the religious conservative Adhaalath Party, and four seats for the opposition MDP. The results for the other 66 constituencies are subject to change with a smaller margin between candidates. In addition to the main ballot boxes for each constituency, several constituents are re-registered to vote in other locations such as industrial islands and resorts. With 140,182 votes counted, newspaper Haveeru has 33 seats for the PPM, 12 for JP, 5 for MDA, 5 for independent candidates, one for the Adhaalath Party and 28 for the MDP. 10:15pm – Former TVM Presenter Aishath Leeza has conceded defeat to the MDP’s Ali Azim in Malé’s Medhu Henveiru constituency. 10:00pm – With no official results as yet from the EC, despite differing results from local media outlets, a picture is emerging of a clear coalition victory in the polls. A combination of local and social media shows victories for prominent MDP MPs Mariya Didi, Chairperson ‘Reeko’ Moosa Manik, Speaker of the Majlis Abdulla Shahid, Rozaina Adam, and Imthiyaz Fahmy. These sources also reveal losses for recent MDP convert Ahmed Thasmeen Ali, and MP Ali Waheed. The Progressive Coalition’s lead in the polls included an entry into the Majlis for former Police Commissioner Abdulla Riyaz with the JP, and a return to the Majlis for Ahmed ‘Redwave’ Saleem, Ahmed Mahlouf, and Ahmed Nihan – all for the PPM. 7:15pm – With vote counting completed in most polling stations, local media has reported the results of roughly half of the 473 ballot boxes. Provisional results suggest that the ruling Progressive Coalition is on course to secure a majority of the 85 parliamentary seats. Some candidates have meanwhile conceded defeat and declared victory on social media. MDP MP Ali Waheed has conceded defeat to the JP candidate in the Alif Alif Thohdoo constituency while MDP candidate for Thimarafushi, Mohamed Musthafa, has declared victory. Several incumbent MPs, including PPM MP Ahmed Mahloof and JP MP Gasim Ibrahim as well as MDP MPs Imthiyaz Fahmy and Eva Abdulla, have also established strong leads in their constituency. With 78,842 votes counted, newspaper Haveeru has the PPM with 30 seats, MDP with 30 seats, JP with 12 seats, MDA with two seats, Adhaalath Party with two seats and independent candidates with two seats. The EC has said it expects to announce preliminary results tomorrow. 6:00pm – Sun reports that observers have been found in order for the count to begin in Thinadhoo. 4:35pm – Sun Online has reported that officials in Thinadhoo, in Ghaafu Dhaalu atoll, are unable to open the box for counting due to the absence of observers. Without observers, Sun reports that the EC has said three people who voted at that box must be present to begin counting, though none are reported to be in the area. At around 2pm this afternoon, Sun had reported that turnout was only 24 percent in the island. 4:25pm – After closing each box, officials will take a half-hour break before counting begins. 4:10pm – Ballot boxes are now closing, with no more people allowed to enter queues. Reports continue to confirm a low turnout, however. 3:40pm – Police have reported that there are not enough ballot papers in Alifushi, Raa atoll, and Kurendhoo in Lhaviyani atoll. Police are working on transporting additional papers. 3:30pm – A 38-year-old man has been taken into police custody in Fuvahmulah after allegedly assaulting his wife. Local media reports eyewitnesses as stating that the man struck his wife after she emerged from the polling place. He reportedly asked her who she voted for and became upset when she named the candidate. 3:15pm – The EC has received 75 complaints in total, including three complaints about names not being on voter lists, five about anti-campaigning and four relates to bribery. Turnout is reported to be low, particularly in comparison to the presidential polls – the polls for which had an average turnout of over 88 percent. 3:10pm – EC currently holding second press conference of the day. The EC did not put up photos in the public list due to the complaints it received about the matter during the local council elections in January. Although there are photos in the lists being used by officials. 3:00pm – Police have arrested two people, one for distributing and another for accepting money near a ballot box at around 2:30pm. Police have confirmed that there have been several reports of distributing money. 2:30pm – “I was unaware that ballot boxes were shuffled. So i had to spend over an hour trying to vote. I wish the SC had better raised awareness about these changes”: Adam Haleem, 34yrs. 2:25pm – “I was undecided about voting too. But am going to go cast a vote now. Despite SC interference, I cannot live with myself if I don’t exercise this right,” said Ahmed Irfan, 28yrs. 2:20pm – “I won’t vote. I can’t make myself participate in another Supreme Court run election. What’s the point? We all know which way the results will lean to regardless of real results,” said Aminath Yulia, 28yrs. 2:10pm – 4,343 election officials are involved in conducting the polls in addition to 1,647 observers, 1,858 monitors, and 1,363 representatives of candidates. EC data reveals there are 240,663 voters eligible to take part in today’s polls – 117,028 female and 123,635 male. 1:45pm – Press release from Transparency Maldives: “Transparency Maldives thanks our observers deployed across the country for their dedication in observing the election processes. Transparency Maldives’ observer network has a wide national coverage spanning resorts, prisons, and abroad in Kuala Lumpur and Colombo. The results we report are based on random sampling and are generalisable to the entire country. These results are based on the observation at the time of opening of polls. The opening of the polls was smooth, and the administrative preparation went well. 79% of all polling stations opened by 8.10am, 20% of polling stations opened within the first hour of the required opening time, and 1% of polling stations opened between 9am and 10am. Nearly all polling station officials were in place at all polling stations. The materials required for voting were present and the ballot papers were counted at 100% of the polling stations. 100% of ballot boxes were verified as empty at the opening of the polls. Candidates were well represented at polling stations. Only 10% of the polling stations did not have a party/candidate observer present at the opening of the polls. Maldivian Democratic Party (MDP) observers were present at 78% of polling stations while 81% of polling stations had observers from the coalition parties, at the opening of the polls. Transparency Maldives also notes that police presence was visible at 93% of the observed polling stations at the time of opening. Observers concluded that the polling stations were set up to ensure a secret vote in 98% of polling stations. Transparency Maldives observers will be closely monitoring the 2% of the polling station where the secrecy of the ballot may be compromised due to the layout of the polling station. 1:34pm – “I have faith in the system. This vote will change our lives for the better,” said Aishath Thaufeeqa, 22. 1:14pm – A voter who displayed a marked ballot paper in Thaa Vilifushi and another who took a photograph of a marked ballot paper in Gaaf Dhaal Thinadhoo have been taken in for questioning by police. An individual has meanwhile been arrested in Male’ near the polling station in Iskandhar School for allegedly obstructing police duty. 12:52pm – “It is important that the government gets majority in parliament. No other way we can have the development we deserve. That’s why I am voting,” said Mohamed Ikleel, 49. “It’s my responsibility as a citizen to vote. Whether it makes a difference or not” said Ali Gasim, 38. “We can’t let Adhaalath into policy making. So it’s important that MDP and PPM [supporters] both go out and vote” said Afiya Saeed, 36. “I am hopeful that this is finally a fair election. Fuwad is no longer there to do fraud. Thank Allah,” said smail Wafir, 53. 12:30pm – A 33-year-old and a 35-year-old has been taken in for questioning by police in Seenu Feydhoo after displaying marked ballot papers. 12:25pm – Speaking to reporters after voting in CHSE this morning, President Abdulla Yameen said he hoped candidates from the Progressive Coalition as well as the Adhaalath Party would secure 65 seats. He added however that the coalition could lose some seats as a result of members of coalition parties contesting as independents, which could split the vote among pro-government candidates. If the government coalition secures a majority, President Yameen said the highest priority on the legislative agenda would be passing bills related to economic policy as well as the revised penal code. He expressed confidence that the coalition would not fall apart after the elections. Yameen also reportedly criticised the current People’s Majlis for not approving two members to the five-member EC to replace its former chair and deputy chair, who were removed by the Supreme Court on charges of disobeying court orders as well as contempt of court. According to online news outlet CNM, Yameen said there was no need to appoint two members to the EC if it could conduct polls with just three members and an acting chair. He however added that the coalition parties would not be contesting the outcome on the grounds of the missing EC members. 12:00pm – “I’ll vote free and fair. I doubt the counting will proceed in the same manner though” said Fathimath Areesha, 36, Seenu Maradhoo. “PPM will win today. Not with support, but with undue power” said Abdul Matheen, 46, after voting in Iskandhar School. 11:40am – Former President Nasheed after voting at Malé City Hall. 11:35am – Police have taken two more persons into custody for displaying marked ballot papers. They were a 29-year-old from Gahdhoo and an individual from Gaaf Dhaal Madaveli. Police explained that persons who display marked ballot papers are released after questioning. 11:30am – The EC urged all voters to go out and cast their ballots as early as possible, and for all election observers and monitors to assure voting proceeds as per the law. 11:25am – Those stations which started late – Shaviyani maan’ugoodhoo and Gaafaru – will be given the full eight hours for voting, says the EC. 11:15am – 12 complaints have been received regarding today’s voting, concerning anti-campaigning, the use of illegal means to get support, regarding elections officials, and campaigning during prohibited hours. While turnout is as yet unclear, unofficial observers suggest it is low. The EC hopes to release provisional results by tomorrow morning. 11:10am – Voting began on time in all but two islands. The EC has received 13 complaints regarding the voter registry – the most serious being five voters who claimed to have been re-registered without their knowledge. 11:05am – EC – now consisting of members Ismail Habeeb, Ali Mohamed Manik, and Mohamed Farooq – begins press conference. 10:55am – Voter turnout in Addu reportedly being affected by poor weather. 9:55am – Police have arrested three individuals for displaying marked ballot papers at polling stations. They were a 28-year-old man from the Feydhoo ward of Addu City, an 18-year-old in Faafu Nilandhoo, and an 18-year-old in Gaaf Dhaal Gahdhoo. Voting was also briefly interrupted in a polling station in Malé for the Maafanu North constituency while police took down campaign banners in the customs area. 9:25am – EC announces first press conference for 11am. All ballot boxes are reported to be open for voting, with the exception of Gaafaru in Kaafu atoll which is due to open imminently. 9:15am – The Human Rights Commission of Maldives (HRCM) issued a press statement yesterday urging all parties and voters to abide by rules and regulations on polling day and to respect the rights of others. 9:10am – In Shaviyani Maaugoodhoo, officials from the Elections Commission’s complaints bureau requested police assistance in taking down a banner in the vicinity of the polling station. Voting had not started in the island at the time. Local media has reported that voting has temporarily stopped for one ballot box in Haa Dhaal Kulhudhufushi after officials discovered that one token number was not printed. In Shaviyani Maaugoodhoo, officials from the Elections Commission’s complaints bureau requested police assistance in taking down a banner in the vicinity of the polling station. Voting had not started in the island at the time. 9:00am – Transparency Maldives – running the largest observation mission during today’s polls – has noted that officials are not allowed to use phones in polling stations, and that a communication official will assist in communications between officials and the EC. 8:15am – Police will today provide elections security throughout the country through ‘Operation Iruvaru’. Police announced last night that investigations were being carried out in different parts of the country into allegations of bribery and drug trading with relation to votes. The Elections Commission (EC) has fined the Dhivehi Rayyithunge Party (DRP) and Progressive Party of Maldives (PPM) over membership forms submitted in violation of the Political Parties Act. The DRP was fined MVR5,000 (US$324) for submitting a number of membership forms with the fingerprint of the same person whilst the PPM was fined MVR6,000 (US$389) for submitting forms in violation of regulations. The PPM was levied a higher fine as it was the party’s second offence, the EC noted. In January, the ruling party was fined MVR5,000 after it emerged that a membership form was submitted on behalf of a deceased individual. The Elections Commission (EC) has said that it is receiving complaints of damage being done to campaign material – such as posters and banners – from most candidates contesting in the parliamentary elections. The commission requested people not do anything that could violate the electoral rights of candidates, and called upon both candidates and supporters to work according to the code of conduct given in Article 23 of the “People’s Majlis Election Regulation 2013”. EC president Fuwad Thowfeek said that the commission was receiving a number of such complaints everyday, particularly from Malé City. “Such acts could disrupt social harmony, and we request everyone refrain from doing any such thing. Parliamentary candidates want to serve the public, and involvement in such things is not a very good start, said Thowfeek. He requested that campaigners paste posters only where it is permitted according to the regulations. During the presidential elections in 2013, the EC received a number of complaints regarding anti-campaigning, though Thowfeek noted that no such issues had come up this time. “But we urge candidates and supporter to refrain from anti-campaigning. We will take action against them,” Fuwad said. Last week, the Adhaalath Party issued a statement condemning acts violating their Hulhuhenveiru candidate Dr Mohamed Iyaz’s electoral rights. The party claimed that posters of some Maldivian Democratic Party (MDP) candidates were pasted over Iyaz’s posters and that his campaign banners were cut down. The MDP candidate for Henveiru North, MP Abdulla Shahid, has also filed a similar complaint with the EC. Shahid’s campaign office said that his campaign posters and banners in the Henveiru North area were ripped and replaced with Progressive Party of Maldives (PPM) candidates’ campaign material. Campaign activities for the parliamentary elections are escalating as the election scheduled for 22 March draws near. A total of 316 candidates are competing for 85 seats this election, more than sixty percent of candidates representing political parties. Earlier this week, the Environmental Protection Agency requested that all contestants ensure that campaign material does not litter the streets of the country, as was often the case during the presidential poll. Th opposition Maldivian Democratic Party (MDP) is running for all 85 seats, while the ruling PPM has divided the seats among their coalition members, with the party retaining just 50 seats. The remaining seats were divided between Jumhooree Party and the Maldives Development Alliance. The Adhaalath Party and the Dhivehi Rayyithunge Party are also competing in the election, while 125 independent candidates will also contest. EC yesterday opened for voters re-registration for those intending to vote at a polling station other than that listed with the commission. The deadline for re-registration is 28 February. The last week’s headlines were dominated by the stabbing of Maldivian Democratic Party (MDP) MP Alhan Fahmy in a Malé cafe. After flying to Sri Lanka for prolonged surgery to repair spinal damage, the Feydhoo constituency MP’s family revealed he will face a hard struggle if he is to regain the full use of his right leg. The attack was swiftly condemned both internationally and domestically, with fellow MP’s pointing the finger at local gangs and their political paymasters. Despite his attack, Fahmy remained determined to contest in the Majlis primaries, despite the MDP refusing to hold a re-vote in the Feydhoo party primary. After losing the poll, Alhan had questioned the fairness of proceedings and will now contest as an independent. Controversy also accompanied a number of other MDP primaries, with Kendhoo constituency candidate Mauroof Zakir considering a legal response to what he considered to have been irregularities stemming from the party’s abandoned polls in late January. Kaashidhoo incumbent Abdulla Jabir, meanwhile, retained his place on the party ticket after the MDP’s disciplinary committee found party regulations did not permit his removal, despite his repeated defiance of the whip. The MDP’s talismanic leader, Mohamed Nasheed, this week told Minivan News he was confident in the transparency of the polls. Discussing the two years since his removal from the presidency, he noted that the current governing coalition would struggle to provide political stability. Following the completion of its primary races, Nasheed revealed that his party’s legislative agenda for the 18th Majlis would include strengthening local government, reforming the judiciary, and eliminating barriers to development. Nasheed’s doubts over the unity of the current coalition appeared well-founded this week as the religious Adhaalath Party announced it would be openly competing with the Jumhooree Party (JP) in five parliamentary constituencies, while talks with the Progressive Party of Maldives (PPM) continue. The PPM’s selection of candidates for the poll continued, after party members in Maavah constituency, Laamu Atoll, demonstrated against the apparent award of the ticket to the current member without a primary. After assigning 13 of its 49 places on the ticket without contests, the PPM is holding primary polls for an additional 27 seats today (Saturday 8), with the method of allocation for the remaining 9 yet to be decided. Progressive coalition partner the JP meanwhile concluded selections for its 28 allocated constituencies, which includes eight incumbent MPs and new member Abdulla Riyaz – former commissioner of police. One person who is unlikely to be standing in the March 22 polls is Dhivehi Rayyithunge Party MP Dr Abdulla Mausoom. As Minivan News’ series of interviews with MPs continued, Mausoom described the occupation as no longer “savvy”. The Majlis continued to hold special sessions this week to help the government raise revenue to meet its 2014 budget commitments, including the reintroduction of tourist bed tax and the raising of T-GST in November. Changes to current import duties were also passed. Following the Criminal Court’s continued recalcitrance after the Majlis’s failure to approve a new prosecutor general, the Chief Justice this week suggested that parliament take some time during the current emergency sessions to resolve the issue. PPM MP Ahmed Mahloof also suggested that he would submit a motion to the house, calling for a public referendum on the death penalty to be held alongside the parliamentary elections. Asked about the practice of female circumcision this week, Figh Academy Dr Mohamed Iyaz Abdul Latheef endorsed the practice, citing several hadiths which he felt made clear the obligatory nature of this procedure. Elsewhere, local heritage group REVIVE announced it would be considering legal action after a centuries old mosque in Malé was demolished to make way for a modern replacement. Finally, as crime figures in the country revealed a huge spike in cases of theft and robbery, a local drug lord appeared to have evaded punishment, leaving for Sri Lanka part-way through an 18 year sentence.